An atherectomy is a procedure used to help unblock blood vessels that have become compromised, preventing blood flow from passing easily through the vessel.The blockages are causes by substances called atherosclerotic plaque, otherwise known as an atheroma.Atheromas develop due to fatty substances building up in the vessels, mainly the most major of the arteries including the carotid artery and the coronary arteries. As the plaques grow in size the occlude the passage through the vessels eventually leading to a complete blockage if not treated before. Once the vessel has become blocked, blood flow is prevented and tissue death can occur to the tissues that have been left with no blood supply. In the case of the coronary arteries becoming blocked, death can occur very quickly as these are the vessels that supply the blood flow to the actual heart muscle, so heart tissue dies. This procedure can be performed either through a surgical operation, with the aid of catheters or using lasers.If a surgical procedure is selected as the best method of treatment, which though nowadays quite rare, this is usually carried on vessels that are in the peripheries, and not on coronary arteries. 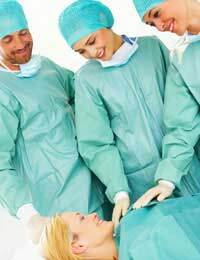 The surgeon can open the vessels and directly remove the plaque. The vessel can be repaired by hand or a synthetic material used as a graft to retain use of the artery.If lasers and catheters are the chosen method of treatment, the procedure is very similar to that of an angioplasty whereby a small incision is made in the arm or groin allowing access to the arteries. Following administration of local anaesthetic and usually some sedation, a small guide wire followed by the catheter, and often laser tip, is passed along the artery until it reaches the site of the plaque. The plaque can be either excise using cutting equipment or removed using laser technology. The site in the vessels where the atheroma was is often then kept patent (open) using a stent which can remain in place. The type of treatment available to the patient is largely dependant on the size, location and the patients overall physical health.The physician will have to carry out a full examination and a series of tests before making the decision as to whether the patient is physically fit enough to undergo the procedure and also whether the vessels can be saved or whether by-pass surgery would be more advantageous to the patient. The patient can often be treated as a day patient or with one overnight stay. Sedation is often offered and local anaesthetic used (unless an open surgical procedure is needed, whereby the patient will have a longer stay in hospital).The incision site is usually very small and will heal fairly quickly with a small amount of bruising. With care and good hygiene practices the patient should be able to regain full mobility within 48-72 hours post-procedure. An atherectomy is a surgical procedure used for unblocking arteries that have become occluded with atheromas, sometimes known as plaques. The most common treatment option is to remove the blockage using catheters that are passed through a small incision in the arm or groin.